William Randell was born c. 1888 in Fulham, London. His parents were Philip and Martha Randell. He had a brother Arthur and four sisters Ruth, Kate, Annie and Alice. In the 1901 census, he was described as a servant (a ‘page’) living at Beaumont College in Surrey where his father worked as a tailor. It is possible that, while working at Beaumont, he came into contact with Edmund, Wilfred and Vincent Stapleton-Bretherton who were pupils at the School. Perhaps this resulted in him being given employment at the ‘The Hall’, home of the Stapleton-Bretherton family in Rainhill (later known as Loyola Hall). The 1911 Census records that Edmund was living at The Hall. In 1913 Frederick Annesley Stapleton-Bretherton, JP was living at The Hall and his son, Edmund J Stapleton-Bretherton was described as an Agent at the Estate Office. William’s regiment went to France in October 1914 and he was killed in action south of Ypres on 22nd June 1915. Initially, his body was interred in a communal grave and later it was moved to the White House Cemetery, St Jean.
" 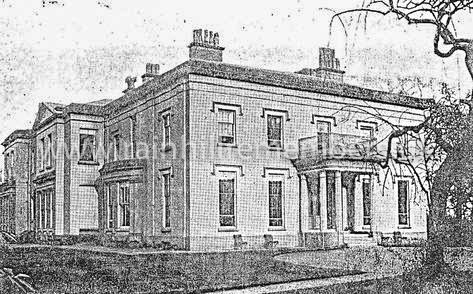 The Hall", Rainhill was where William worked for the Stapleton Brethertons before the war.